Currinda allows multiple abstract review stages and allows you excellent flexibility to design how abstracts or full papers will be reviewed. Each stage can be flexibly configured to suit a range of alternative reviewing methods. Note: A comprehensive guide to the complete setup process for abstract submissions and reviews can be found in this article. Open the Review Stages setup screen via the Reviews>Review Stages tab. Note that Currinda, by default, creates an ‘Initial Review’ stage for your review process, which you can rename and amend to suit your needs. Click Submit to save and continue to the Review Criteria tab. Complete the information in the Review Criteria tab. 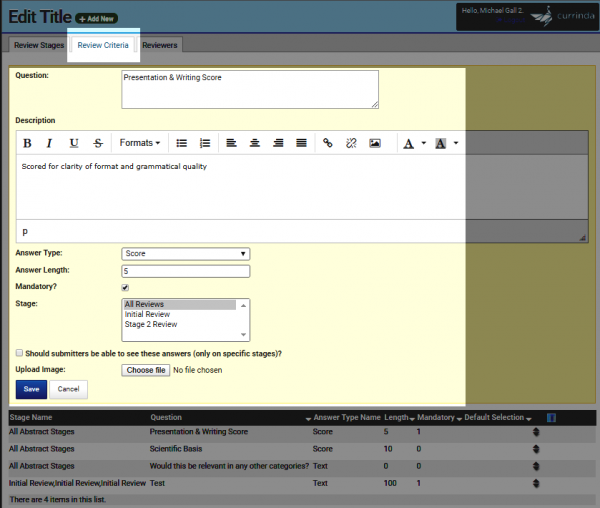 Review Criteria are linked to the Review Stage, you’re also able to include a file upload which will allow reviewers to upload edits to a full paper. Reviewers and Convenors can be assigned via the Reviews>Reviewers tab. A Reviewer or Convenor must have a Currinda User Profile. Your nominated reviewer/convenor can be located via the ‘User’ search box. The key difference between a Reviewer and Convenor relates to viewing priviliges of the submissions. A Reviewer can view the submissions they have reviewed. A Reviewer is unable to view the complete list of submissions, or other reviewers’ reviews. A Convenor (accessed via the >Reviewers>Convenors tab) is able to view the complete list of submissions and all completed reviews. These settings can be applied across Categories or the entire Event. Note: Currinda’s Reviews process allows flexible configuration of Reviewer and Convenor settings to cater for multiple categories and streams within complex programs. For simple events and programs (eg where only a single submission category exists), simple setups of Reviewers and Convenors be easily applied event-wide. To allocate abstracts to a review stage, go to the Search tab on the abstracts left hand menu, search for the abstracts you want to allocate (scroll down to find all the abstracts listed). 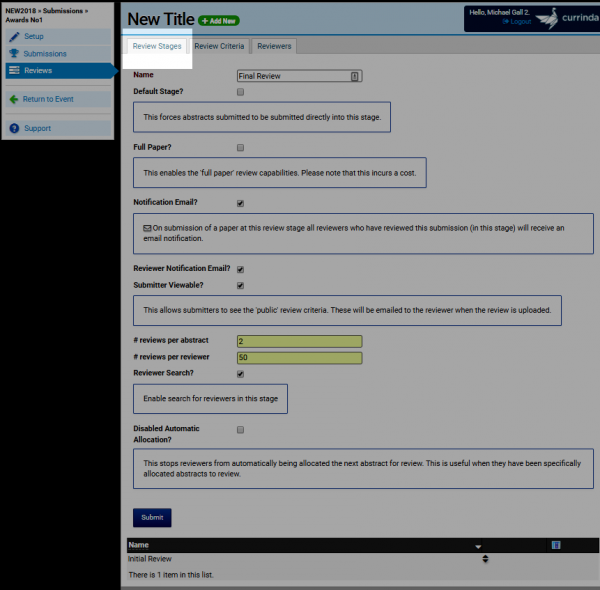 Select the abstracts you want to allocate to the stages and in the batch actions drop down box, select set review stage. Click preview, and then select the confirm checkbox and click process. These abstracts will now be made unavailable for review for “initial stage” reviewers, but visible to convenors in the other tabs. Reviewers can select the tab of which review stage they wish to review. Allocation of abstracts works the same way, ie. the abstract with the lowest number of reviews will be selected and each reviewer can only review each abstract once.